Sanctions forming chokehold around Iranian regime, forcing it to end fuel subsidies. 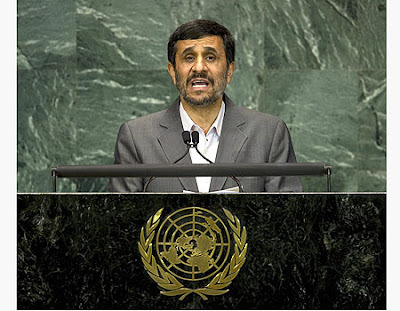 Don't buy into Iranian propaganda and Ahmadinejad's diversionary visit to Lebanon. The sanctions are forming a chokehold around the Ayatollah regime and Tehran doesn't know how to free itself. November, for example, is supposed to be a dark month in Iran, yet authorities there are hiding it as much as possible, This month, the government will be forced to put an end to fuel subsidies, while Europe's skies will be fully closed off to Iranian planes. Should the West persist with this move, it would lead to a complete boycott and total isolation of the Khomeinist state. All European states, with the exception of Germany and Austria, closed off their skies to IranAir and private airlines in October. This important step was barely noted by the media here, yet once both Germany and Austria also join the boycott, no state would be willing to fuel Iranian planes – and without refueling they can't fly. Some companies cancelled their contracts with Iran and others are waiting for them to expire, yet no dignified company would risk its permit to enter the United States. On top of this, all major energy companies already cut off their ties with Iran. This includes the British-Dutch Shell, the French Total, the Italian ENI, the Norwegian Statoil, and others. This means that Iran is already having trouble getting refined fuel. While Chinese and Russian companies are willing to replace Western companies, fueling in Europe for example will no longer be possible by any foreign company. Meanwhile, Lloyd's, which insured the numerous trucks exporting fuel from Iran, ended its business relationship with Tehran. Now, these trucks cannot enter some states. And there's more to come. As the government in Tehran is facing a real crisis, it announced that on November 21st it shall put an end to fuel subsidies for private vehicles. Up until now, each driver received his first 60 monthly liters of fuel for a ridiculous price of 10 cents per liter, and dozens of more liters at a low cost. Yet in November this arrangement shall draw to an end, which may provoke the angry street. Iranian citizens know that their government invests crazy sums of money in military equipment and distribution of funds worldwide, at their expense. For that reason, authorities have trouble subsidizing the fuel, a move that costs $100 billion a year. The Khomeinist revolution is running out of the energy needed to meet the radical targets it set for itself. The world should continue focusing on the sanctions, and then it would be impossible for Ahmadinejad to free himself of the chokehold, which would only get tighter. As Iran persists in its refusal to renounce its nuclear program or even embark on negotiations, the next step should be a full boycott on Iranian airports – as was done to Gaddafi until he caved in. This can be done without a United Nations decision: A European Union decision would suffice, the UN shall follow, and many states would join in. So don't buy into the shows put up in Tehran and southern Lebanon; they're a diversion. The Iranian regime is very concerned, and now is the time to keep pressing it.